At Superior Threads, we focus on quality a lot. We know that if you use high-quality threads in the production of your quilt, not only will you have fewer interruptions due to thread breaks and skipped stitches, but you will enjoy the process of creating much more. We have a high standard for quality and usability that we define as Superior Stitchability. Our cotton threads are a perfect marriage of high-quality raw materials and advanced processing techniques. The raw cotton boll (the white fluffy, fibrous ball that a cotton plant produces) is made of hundreds of thousands small fibers, called staples. There is a direct correlation between the length of a staple and the quality of a thread. The longer the staple length, the smoother and stronger a cotton thread will be. Extra-long staple Cotton is the highest grade because of the length of the fiber. There are many countries that grow cotton in the world (most recent count is 80 countries). The climate, soil conditions, access to water, minerals, and exposure to sunlight all affect the cotton crop. Egypt's fertile Nile delta region has proven to be a rich area for cotton crops to grow. The growing conditions are close to perfect and the extra-long staple cotton crop is the best in the world. The U.S. also grows a quality cotton under the Supima moniker. Egyptian-grown cotton is the best cotton to turn into sewing and quilting thread due to it's characteristics. 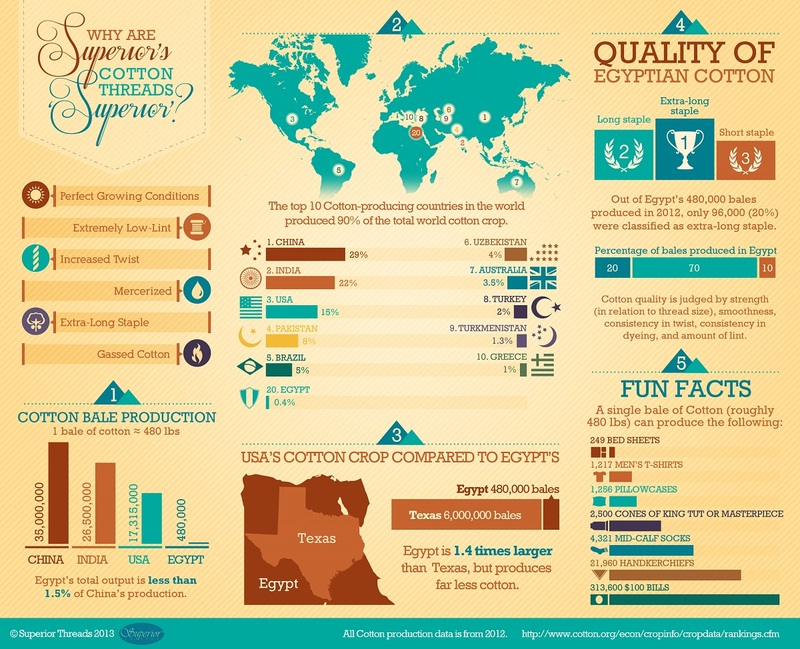 View our Superior cotton infographic. View our Egyptian-grown extra-long staple cotton piecing and quilting thread, MasterPiece.